The Zionsville Town Council has presented a new plan for building and financing a town hall, but the proposal has met resistance from some residents who claim it’s too expensive, too risky and too soon. The plan calls for borrowing $10.2 million to build a 41,300-square-foot town hall behind the current one. Zionsville would make biannual payments on the project over 25 years through a lending process that is similar to a mortgage. The proposed plan has an interest rate of 2.75 percent that could be recalculated in 10 years. The council is expected to discuss the issue at its Feb. 1 meeting. The adjustable interest rate is just one of many concerns for Zionsville resident Rick Hardin, who works in the construction industry. He doesn’t oppose Zionsville building a new town hall, but he believes it could be done on a smaller scale or that the council should at least provide more time for the public to voice their concerns. Others are concerned that the project will use funds that could have gone toward addressing other problems in town, such as infrastructure and safety issues. One Zionsville resident started an online petition asking the council to “hold off on approving anything on a new Town Hall” until “safety concerns are addressed on Oak Street with a roundabout per the 2013-14 Traffic Study or what is recommended by an independent engineering firm.” As of Jan. 28, the petition had about 185 signatures. At a special meeting to discuss the financing plan on Jan. 21, Councilor Tom Schuler raised similar concerns. “I’m surprised that we would be that aggressive when we’ve also got a lot of other issues around the town,” he said, citing increased traffic on roads and lack of raises for town employees. He also said that during his time on council he has never seen anything but a tight budget, and he is concerned the town will have little money for anything else if the council commits to the new financing option. The council did not allow the public to speak at the special meeting. Zionsville resident Eric Goehausen attended the meeting and said he believes there has been a “lack of transparency” on this issue. The town had previously discussed selling bonds – a more traditional form of government financing – to pay for the new town hall. Using an installment purchase contract instead allows the town to avoid paying fees associated with bonds and gives the town greater discretion on which funds are used to make payments. The plan calls for mostly using funds that will be available to the town in the future but were not included or available in the 2016 budget. The proposal calls for using an annual $283,066 in additional County Option Income Tax revenue that was not calculated in the most recent budget, $115,000 from food and beverage taxes, $55,000 from the Cumulative Capital Development Fund, and $94,000 in revenues from the Quail Run TIF area, which includes the site of the current town hall that is expected to be torn down and redeveloped into retail. Other funds could come from Boone County TIF revenues. The council is also scheduled to vote Feb. 1 on a plan to permit revenues from the 2015 334/700 East TIF area – which is on the west side of town – to be used for the project as a backup, but “without a current expectation that they would actually be needed for that purpose,” according to Bruce Donaldson, an attorney representing the town. Town hall is not within this TIF district. The current town hall is in an aging former church building that would cost millions of dollars renovate without providing room to expand. Councilor Jeff Papa said at the special meeting that officials looked all over town at other options for a new town hall, including at Creekside Corporate Park and the former PNC bank building site. In the end, Papa said the latest proposal makes the most sense in the long term. “The more we looked at it, I think over a 30-year timespan it’s almost silly not to build a new building, because it’s almost going to pay for itself,” he said. Other councilors said that the project isn’t just about the money, but perception. The current town hall is in an aging former church building with ongoing maintenance and space issues, which could be a factor in business owners choosing to go elsewhere, said councilor Joshua Garrett. “If I’m (holding a meeting) in a closet with a boiler that’s busted, what kind of impression does that make?” Garrett asked. 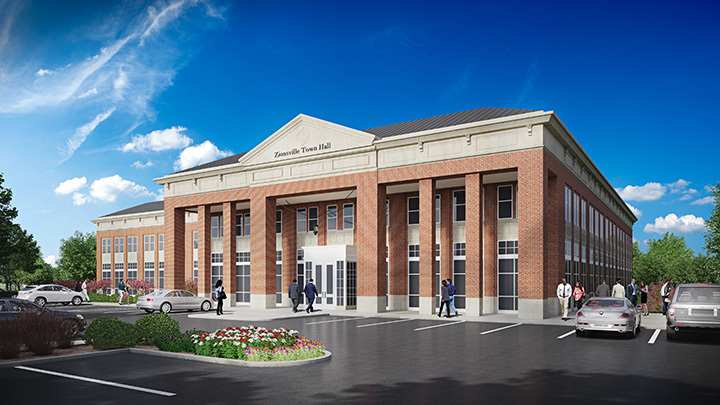 CSO Architects is working with the town to finalize a development plan for the new town hall, which is expected to go before the Plan Commission once complete.